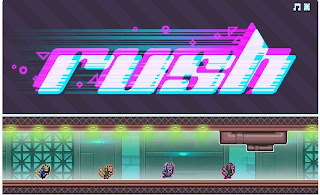 Rush is a new platfomer racing game created by nitrome. This running game features a gameplay similar to Gravity Guy, an iphone game which you flip gravity. But this one is with a twist of power ups and various obstacles. There are two modes in this game - race mode which is a single player mode that will unlock new levels and eliminator mode in which the last runner standing is the winner.